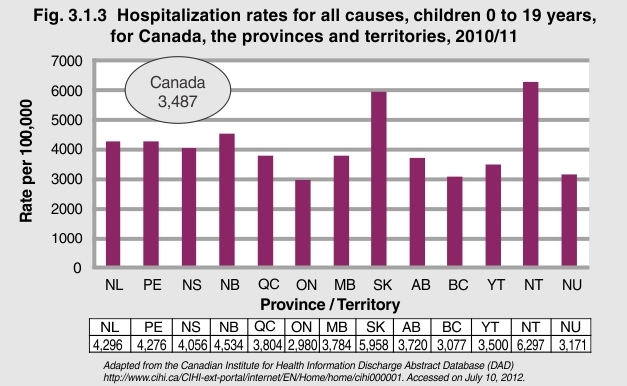 In 2010/11, hospitalization rates for children and youth 0 to 19 years of age were highest in the Northwest Territories (6,297/100,000) and Saskatchewan (5,958/100,000) and lowest in Ontario (2,980/100,000) and British Columbia (3,077/100,000). Differences in hospitalization rates in Canada may be attributable, in part, to the varying proportions of rural and remote communities, the socioeconomic status, and the number of Aboriginal children living in each province and territory. The rates of injury are higher in rural and remote communities, for Aboriginal children, and for those with a lower socioeconomic status. Further people in these situations often have to travel longer distances to reach medical services, thus increasing the likelihood of an overnight stay. The variation in hospitalization rates may also reflect differences in the management of care across jurisdictions1. 1Rural and Northern Healthcare Framework/Plan (2010). Ministry of Health and Long-Term Care. Accessed on May 28, 2012 at http://www.health.gov.on.ca/en/public/programs/ruralnorthern/docs/report_rural_northern_EN.pdf.